This beautiful weather we’ve been experiencing for a week now is making it very difficult for me to stay indoors and do what needs to be done – like posting to this blog! Today my husband and I started by clearing out a lot of junk out of the garage but as the day wore on we both found ourselves sitting under the tree and watching the wildlife scurry around the pond. Dinner was cooked on the grill and we ate on the patio. What a wonderful day! I justified the easy day by telling myself I’ll take it for my birthday instead of Monday – works for me (I don’t know what other excuses I’ll use if this weather holds much longer)! I wanted to share these photos of my recent shutter classes. I’m really bad about remembering to take photos during classes because I’m usually chatting and sharing techniques and ideas and before I know it the students are gone and I’m packing up. 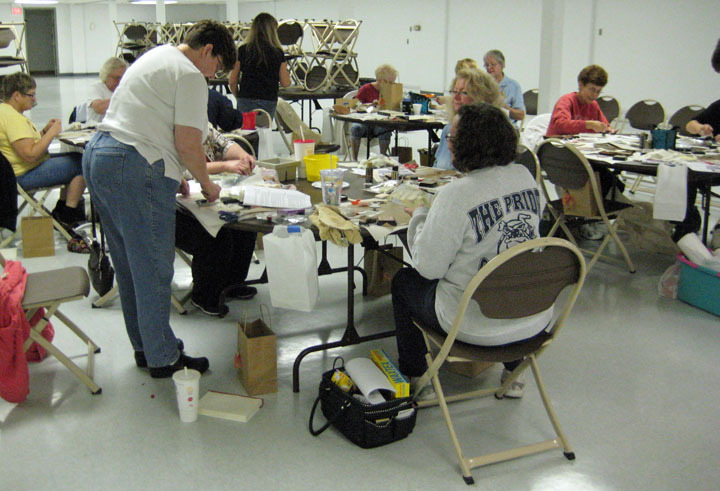 This first photo is the first group of students working on their shutters during class at Scrap Tales. This next photo is at Scrapbook Peddler in Saginaw. I caught the students just as some were leaving but I really wanted to share their shutters with you. They worked hard on them and they each created very unique looks to fit their decor. I just love teaching and watching the students go off on their own allowing their creativity to jump out and take over. One of my most enjoyable teaching experiences recently was with the Brush Benders painting group in Brighton. This is a very creative group of students who are usually much more structured in their meeting sessions and their craft than I. 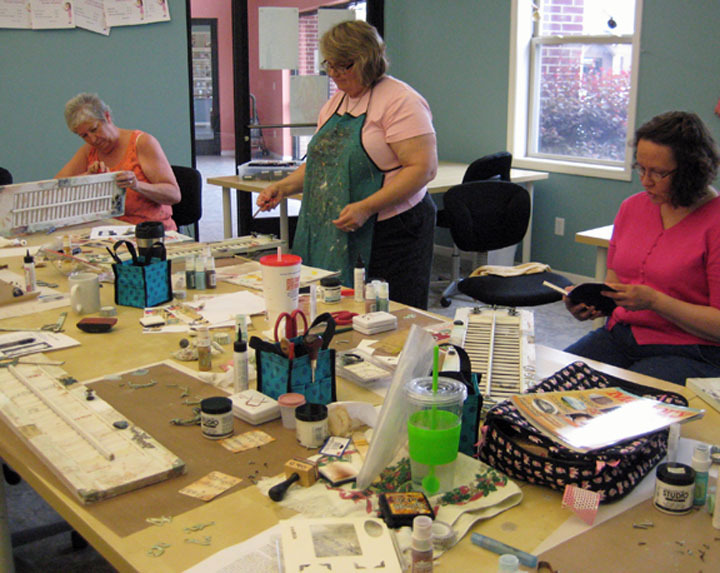 But they gave it their all as they experienced playing with gesso, Distress Inks, Grunge Board, paints and gel mediums in my version of painting class. I’m currently working on some classes for Fall and Christmas and I’ll have some sneak peeks to post later this week so stay tuned. I will be teaching in Flint and Saginaw this weekend so hope to see you there! Happy Birthday Linda have a wonderful day. I am excited to see your classes for the holidays. the days sure have been beautiful. Makes me wish we could have a couple more months just like this last week. But then I guess we wouldn’t appreciate as much. Glad to hear you are not wasting your teaching skills under a rock, with Scrap Tales gone. You are so good at teaching. 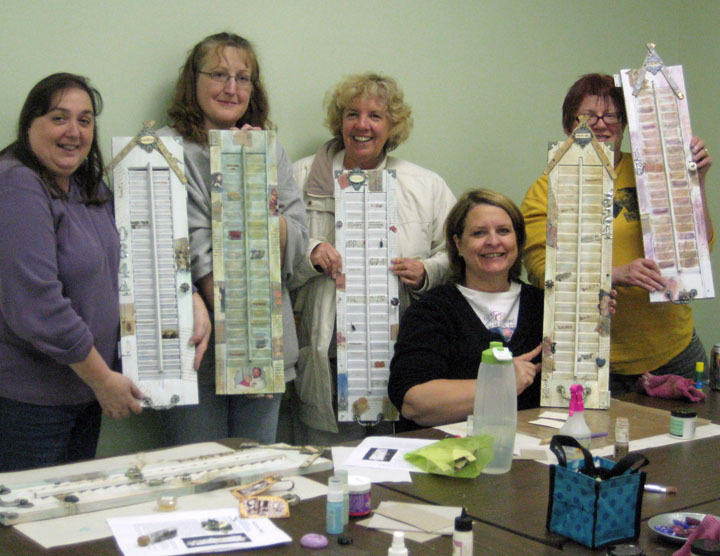 I will forever cherish the Tim Holtz tag techniques class I took with you teaching. One of my best memories. It looks like everyone had lots of fun!